For a long, long, long time cattle ate nothing but grass. Well, okay, they also ate forbs, shrubs, and tree leaves, but yesterday's cow would have leered at the modern feedlot. "Smells funny in there," I can imagine them thinking. Once the modern beef production machine decided corn was the answer, seed stock producers proceeded to breed cattle to gain on corn. Tall, big framed, well-muscled cattle with less girth became the norm. Performance cattle they were called. They performed for the feedlot and packing house owners, but they cost the rancher, because he was feeding the mothers of those Performance calves, and they required lots of hay and supplements in order to breed every year. Hard-doing cattle, that's what those mothers are called these days. The picture above is my grandfather's first and only herd of registered angus cattle. (He transitioned to commercial cows not wanting to deal with the additional work that goes into to raising registered stock) What is interesting about this, is that over 50 years later, this is still the type of cow I want to produce: a moderate sized cow with lots of capacity. We're breeding to take a little hair coat off the original aberdeen angus model, but don't want to change a whole lot about cows that were bred for hundreds of years to turn forage into meat and milk. 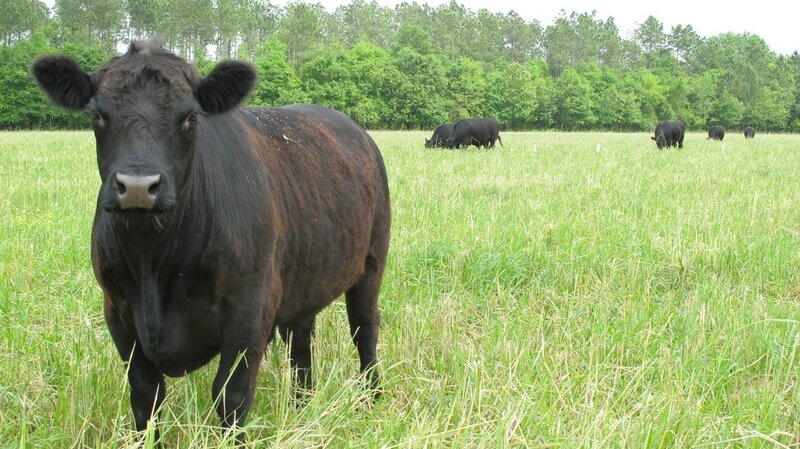 The picture below is of a recent grass finished steer on our farm. In order for commercial cattle to produce a profit for a rancher, a mother cow must be suited for her environment. She must make her living by grazing the pastures and raising a stout calf every year for a decade or two. It's expensive to develop or buy a heifer calf for breeding stock. Most ranchers don't break even on her until she's raised her 8th or 9th calf in a row. Reproductive Longevity is by far the most profitable trait a cow can have. Sound feet, good udders, and a calm temperament are also very important - but if she isn't raising a calf every year, you're losing money.